Developing a great outside project can be a bit like producing a good meal. Where ingredients, cooking skills and a tried and true recipe can produce great results in the kitchen, for an outside project, good materials, expert craftsmanship and a simple design will always be a winner. Take this project, completed by the team at Outside Concepts’ Western Branch in Victoria. The owners of the cute Altona North cottage wanted a stunning deck and verandah to provide an area to entertain and relax off the back of the house. Using the cottage and the back of the house’s cream tones as a starting point, a simple skillion verandah was designed and built, and then painting to match the house. A Colorbond and polycarbonate roof was installed on top of the verandah, to provide protection from the elements while still allowing plenty of natural light to enter the verandah and the back of the house. 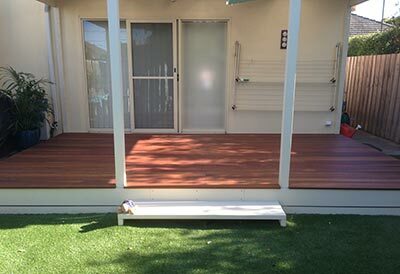 Then, to complete the project, a beautiful but simple Jarrah deck was installed. The rich, red hues of the Jarrah perfectly complement the cream of the verandah and house, creating a stunning result.